Budget 2014 delivers a fully balanced budget focused on core areas that support families and communities—health, education and supports for the vulnerable—while continuing to build Alberta. With $1 billion in new operating funding for health, K-12, post-secondary education and human services to ease growth pressures, Budget 2014 implements the next phase of the Building Alberta Plan to invest in families and communities, live within our means and open new markets for Alberta’s resources for a stronger and more prosperous future. While delivering an operational surplus of $2.6 billion, Budget 2014 continues government’s commitment to fiscal responsibility by keeping operating expense growth below population plus inflation for a second year in a row. There are also no new taxes or tax increases. Budget 2014 also implements a renewed purpose for Alberta’s savings. Two new endowments within the Alberta Heritage Savings Trust Fund will encourage social and agricultural innovation. A new Alberta Future Fund will provide flexible funding for future strategic opportunities offering long-term benefits to Albertans and the Alberta economy, and the Heritage Scholarship Fund will be enhanced to support students exploring opportunities in the trades. As the next phase of the Building Alberta Plan, Budget 2014 will invest $6.6 billion this year and $19.2 billion over the next three years in essential infrastructure needed to support Alberta’s exceptionally strong population growth. Alberta is expected to remain Canada’s fastest-growing province in 2014 and 2015, growing by about 100,000 people each year. Budget 2014 commits funding for 155 K-12 school projects, seven post-secondary projects, 24 health facility projects, 258 kilometers of new or twinned highways and 2,500 kilometers of rehabilitated highways over the next three years. Operational surplus of $2.6 billion. Net asset improvement of $1.1 billion, which is also the consolidated surplus. Operational and consolidated surplus forecast for all three years of the fiscal plan (2014-17). Zero dollars are being borrowed to pay for programs and services. All borrowing will be to support the capital plan. Total revenue is $44.4 billion, 5.4% higher than last year when flood-related revenue from the federal government is removed from the 2013-14 forecast. Revenue growth is a result of higher oil prices, increased personal and corporate income tax revenue and increased federal grants due to equal per-capita health transfers for the provinces. Non-renewable resource revenue is $9.2 billion, 6.7% higher than last year due to higher oil prices, a lower differential and a lower Canadian dollar. Total tax revenue is forecast at $21.1 billion, 5.0% higher than last year due to population growth, a strong economy and higher wages. Total operational expense is $40.4 billion, which includes a 3.7% increase in operating expense. $1 billion increase in spending in health, education, post-secondary education and support for vulnerable Albertans. $6.6 billion in capital spending this year, totaling $19.2 billion over the next three years. Includes 155 school projects, seven post-secondary projects, 24 health facility projects, 258 kilometers of new/twinned highways, 2,500 kilometers of rehabilitated highways. $859 million in flood recovery projects, mostly for mitigation to help Alberta communities limit the impact of future flood events. Capital debt servicing costs: $421 million, or 1% of operational revenue. The debt servicing limit is 3% of operational revenue. Total savings are expected to be $23.9 billion by the end of the 2014-15 fiscal year; $26 billion by the end of 2016-17. Budget 2014 commits $1.4 billion to innovation and strengthening labour market capacity through the creation of new endowments, a new fund and adding to the existing Heritage Scholarship Fund. The Contingency Account will reach $5 billion this year, its targeted amount. Crude oil (West Texas Intermediate or WTI) forecast: US$95.22 per barrel in 2014-15. Western Canada Select (WCS) forecast: Cdn$77.18 per barrel in 2014-15. 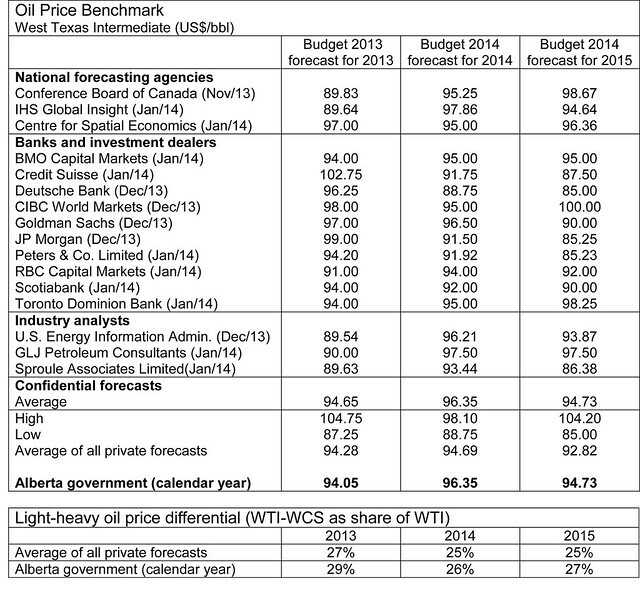 The differential (WCS/WTI in Canadian dollars) forecast: 26% in 2014-15. Natural gas price forecast: Cdn$3.29/GJ in 2014-15. Raw bitumen production forecast: more than 2.3 million barrels per day in 2014-15. The Canada/U.S. exchange rate forecast: 91.0 cents in 2014-15. Economic growth is expected to be 3.7% in 2014. Net in migration forecast for Alberta: 83,700 in 2014. Total population growth is expected to be above 100,000 in 2014 and 2015. Alberta unemployment rate forecast: 4.4% in 2014-15, which will remain one of the lowest in the country. Alberta’s economic forecasting model is based on all major aspects of economic activity. It is updated with the latest provincial data each year and is adjusted regularly to capture structural changes and current trends in the economy. The province’s forecasting process involves significant consultation with government departments and private sector organizations. As consultation is a critical part of the forecasting process, the Alberta government held two energy and economic forecasting summits in 2013 - in July and December. The summits brought together senior economists from major Canadian financial institutions to explore and share best practices and new ideas. Government’s forecast for oil prices takes into account private sector oil industry consultant forecasts. In Budget 2013, the government’s forecast for 2013 was about the same as those in the private sector, other provinces and the federal government. In Budget 2014, the government’s forecasted WTI oil price for 2014 and 2015 is slightly higher than the average of private sector forecast listed below but still well below the high end of the range. However, the light-heavy oil price differential is higher, or more conservative, than the private sector average forecast over the outlook period. The government surveyed the following companies on their forecast of the light/heavy differential: PIRA Energy Group, KBC Advanced Technologies, IHS Cera, Inc, Peters & Co Ltd,BMO.